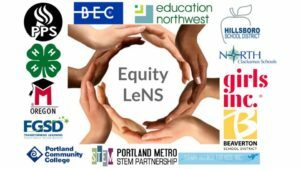 PMSP partners have long asked for access to professional development and consulting expertise with a focus on equity issues, contexts, and perspectives unique to STEM. By searching, we found that our region contained exceptional equity partners targeting communities of color, girls, youth with disabilities, youth experiencing poverty and exceptional science and/or math pedagogical (how students learn science and/or math) experts. However, professional development experiences that brought together equity and STEM did not exist in the region and - when we looked nationally - the opportunities were very limited, very expensive and only offered brief trainings. We know from the research that 1-day or 2-day PD without ongoing partnership and support does not impact practice. We thus brought regional equity experts and STEM experts together to co-create training modules focused on building allies*. The workshops have received highly positive reviews.